THEY’RE NO ANGELS. 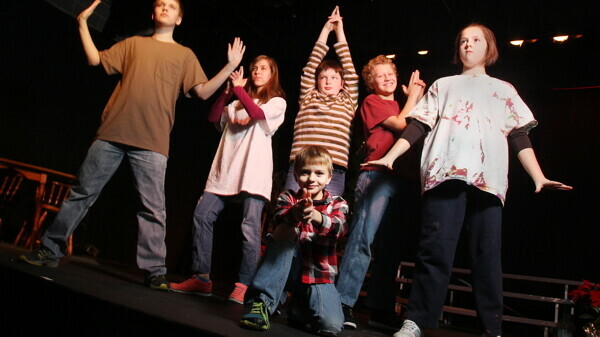 The troublesome Herdman children cause chaos in the Chippewa Valley Theatre Guild’s The Best Christmas Pageant Ever. A very funny and charming play that will be great for the whole family is how director Kimberly Butnick described The Best Christmas Pageant Ever, the next production in the Chippewa Valley Theatre Guild’s season. Butnick is very excited about The Best Christmas Pageant Ever, which she said is the first script that actually made her laugh out loud. The play is based on a young adult novel and follows the Herdman kids, a group of bullies who get tricked into going to church. As a result, the Herdman kids want to get involved with the Christmas pageant, causing a chaotic string of events: Everything that can go wrong does. Since most of us have been involved in a pageant at one time or another, the theme of how hectic such a show can be makes this play very relatable, and everyone who goes is sure to find something they enjoy. The majority of actors and actresses involved in the production are children, including Sophia McCutcheon and Eliot Gannon who will portray Beth, the play’s narrator of the play, and her brother, Charlie. Even though most of the players are very young, Butnick said they have learned quite a lot and have come a long way with the production. They are sure to make a loveable cast, one that everyone will get a good laugh from. If you are looking for something to do with the family, this would be an excellent choice. The play isn’t long, running about one and a half hours, so kids shouldn’t get to fidgety when sitting through the performance. The Best Christmas Pageant Ever will not let you down if you’re seeking some good holiday laughs.